After winning the last match, Winning combination will not be tinkered much. Debutant Navneet Singh can, however, be replaced by Nikhil Dutta after his poor performance. Mohammad Sami finally found his form and can be key for the team to take crucial wickets and book place in playoffs. Kamran Akmal is a great T20 hitter at top-order and can fire in any match so is the best option for captain in the grand league. VK will most probably go with the winning combination as they do not have any good option in the bench. Andre Russell has been in good form with the bat as well as ball and can be key in tonight’s match. Expect the West Indies trio at the top to come to all guns blazing on a not-so-good bowling attack. 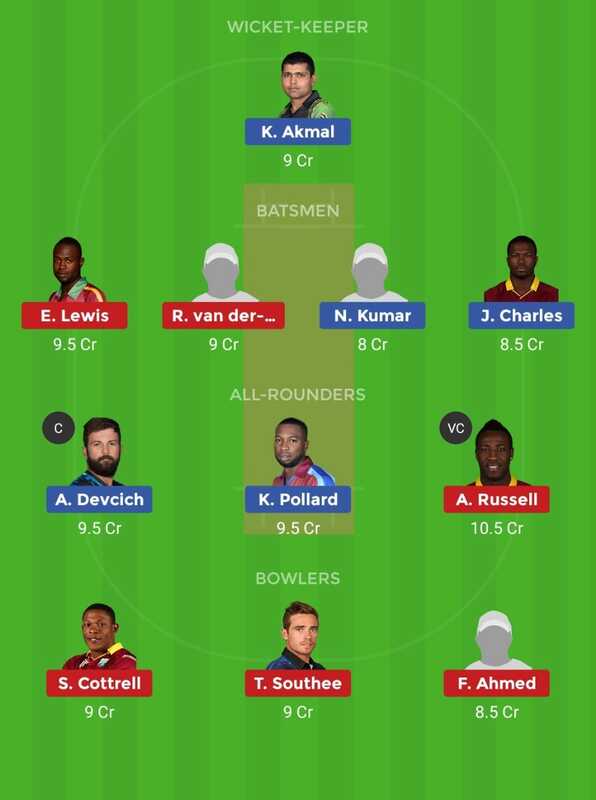 Captain and Vice-Captain choices: Andre Russell, Kieron Pollard, Evin Lewis, R. Van Dussen, Anton Devcich, Steven Smith. For Grand leagues: Kamran Akmal, Chris Gayle, Chadwick Walton.